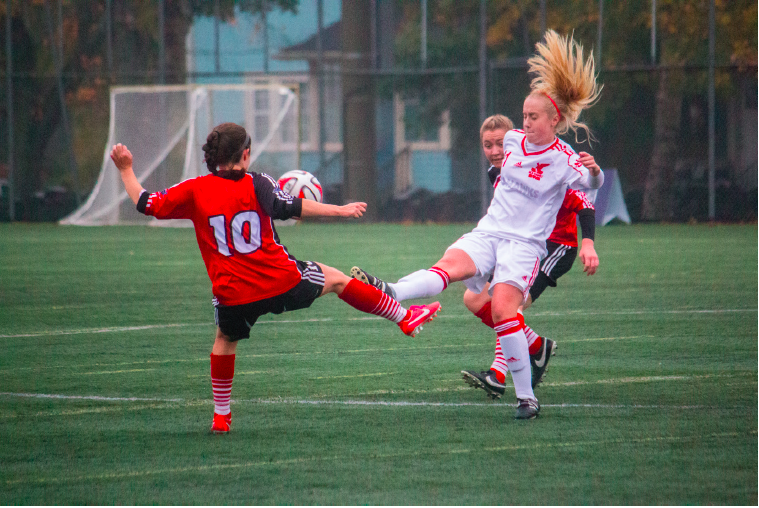 The Memorial Seahawks, who started their season with a 2-3 record, stunned the UNB Varsity Reds at Wickwire Nov. 2 in the finals of the AUS women’s soccer championships, winning 3-1 in a rain-filled affair. The V-Reds jumped out to an early lead off a corner kick from Lucy Parkin that found the head of Hayley Gates in the 26th minute. The Seahawks came right back with a goal of their own 10 minutes later, though, from Hannah Rivkin. As the skies opened up in the second half, so did the V-Reds defense. Jesse Noseworthy scored two goals within five minutes to give Memorial a commanding 3-1 lead with just over 20 minutes to play. The Seahawks ran down the clock to give themselves their first ever AUS women’s soccer title. After the game, Noseworthy was elated to beat the top team in the league. The Canadian Interuniversity Sport (CIS) eighth-ranked V-Reds entered the tournament as the favourite, winning 10 of their 13 regular season games and only losing one match throughout. The Seahawks came alive midway through the season, going undefeated through their final eight matches to finish second in the league at 9-3-1. Memorial’s first two matches of the season were against the V-Reds. They lost both games by scores of 1-0 and 2-1. Seahawks’ head coach Walt Mavin said remaining composed would be their key to success. Both teams had close semifinal matches. UNB edged Acadia 2-1, while Memorial’s match against Cape Breton was decided by penalty kicks. Noseworthy said the momentum gained in their Capers match transition into finals. “Once we got our game down, we started passing it around and feeling confident. Then things started working for us,” she said. The Seahawks don’t have a lot of time to celebrate as they advance to the CIS championships in Laval from Nov. 6-9. Mavin said he believes his team has the ability to find success at the national level, too.